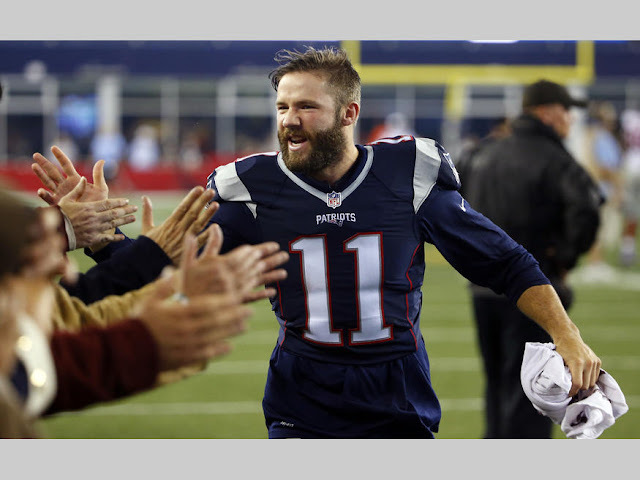 Julian Edelman loves Tom Brady and Boston, and they love him back. But Edelman loves Brady so much that he tried to be just like his signal-caller when he was in middle school. "I remember being in eighth grade and pretending to be Tom Brady at recess and now I am teammates and friends with Tom Brady. We held up the Vince Lombardi trophy together. So yea, playing for the New England Patriots has been my greatest achievement, it has been the highlight of my life no doubt." As it relates to the city of Boston, Edelman, like so many athletes who have played for the city across different sports, said how special of a town it is. "I'm a product of the late '80s, early '90s, the Bill Walsh era at the San Fransisco 49ers -- so being a Patriot in a town like Boston reminds me of that golden era of football." Edelman sounds like a guy who will call Boston his home year-round. Other Patriots like Tom Brady and Danny Amendola live in Boston throughout the year, and former Bruins forward Shawn Thornton once said he would live there once his playing days are through.